In a move that has left the Twitterverse reeling, YouTube has pulled the ad revenue from a video by popular vlogger and filmmaker Casey Neistat, prompting his followers to show support and donate to a fundraiser dedicated to the victims of the bloody Las Vegas mass shooting. But what is particularly problematic about this situation is that it has outlined a discrepancy in the way YouTube treats its creators, suggesting the video sharing service is arbitrarily playing favorites. Earlier this week on October 2, Neistat posted a clip, announcing he has set up a GoFundMe fundraiser for the victims of the Las Vegas tragedy. The YouTuber promised that he will personally make sure no fees are taken away from the sum and all funds raised will go to affected individuals. In addition to this, he further revealed all ad revenue from the video will also go to charity – but it seems YouTube is having none of that. The Love Army for Las Vegas fundraiser went on to accumulate more than $250,000 in 48 hours. Since then, the sum has increased to a total of almost $280,000. Yesterday on October 5, the vlogger tweeted to express his disappointment that YouTube has deemed his video “not suitable for advertisers,” pulling all ad revenue from it. 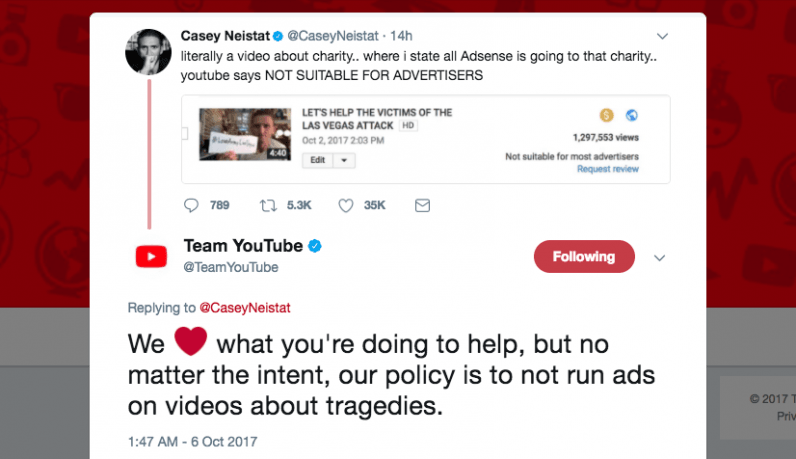 We ❤️ what you’re doing to help, but no matter the intent, our policy is to not run ads on videos about tragedies. There is nothing wrong with having policies that make it difficult for individuals and businesses to profit from catastrophes, and it is terrible when such policies come to interfere with actually well-intended initiatives like Neistat’s. There is an argument to be made that some situations warrant more lenient treatment than others. Yes, this is admittedly not always ideal: Arbitrary censorship could be equally damaging or beneficial to both well and ill intended purposes. Sticking to strict rules limits the margin of error. But here is the issue with this: YouTube is not at all consistent with the way it enforces its own rules – and this makes its response on Twitter particularly hypocritical. Fellow YouTuber Philip DeFranco has since provided screenshots showing the video service running ads on another video about the Las Vegas mass shooting (coincidentally uploaded by the official Jimmy Kimmel Live account). Above anything else, this instance goes on to show all the chaos taking place behind the scenes. It also touches upon YouTube’s continuous struggle to find a more viable way to supervise and moderate content on its platform. This development comes after a long string of complaints from YouTube creators criticizing the platform for its increasingly restrictive – and inconsistent – ad policies and algorithms. The so-called ‘adpocalypse‘ began when YouTube vowed to enforce stricter policies for displaying ads under potentially controversial content. The discussion was foreshadowed by the massive PewDiePie anti-semitism scandal that cost the star his partnership with Disney as well his YouTube Red show. But here is the deal: Though firmer policies could indeed limit opportunistic creators from cashing in on other people’s tragedies, it’s disheartening to watch initiatives like Neistat’s take the fall while brands continue to profit from the same practice. DeFranco is right: YouTube needs to try harder to be better. Meanwhile, those sympathetic with the Las Vegas victims can contribute to Neistat’s Love Army for Las Vegas fundraiser here.